Cate Kendig sat down with me at Southern Railway Taphouse a couple weeks ago to talk about account management. She went with a vodka soda, splash of cranberry; I opted for the Stone RVA IPA. This is a (lightly polished) transcript of that conversation. Not included are the pleasant sounds of Cate stirring her beverage with its straw or the 90s playlist hovering over the din of the happy-hour crowd. D: How did you start in account management? C: I started as an account representative at The Martin Agency, more as a support role to the account managers who would really dial in the relationships and communication. As I grew, I moved into a relationship role. My position at The Martin Agency was print media, and I was lucky enough to ride the digital wave, so I started to work with digital publishers. As clients transitioned to digital, I started to work on GEICO and their local search strategies online. That’s when I started to get face-to-face client interaction with large brands versus phone calls and emails. When I left the agency to come here, there was a huge party and GEICO was there. We were hugging and taking pictures. For me it has always been about the relationships. I want my clients to feel like they can come to me for anything. D: Do you feel like that relationship focus is the aspirational vision of all account managers, or do you have a unique vision? C: I think that my approach is more personable. I try to make them more of a friend and confidant versus only presenting the work that we do. Clients value honesty and passion. Clients value honesty and passion. If something isn’t going right or adding up, I don’t let that fly. I battle to get the right answers for them. That may mean going back to vendors, going back to the team, going to my managers—just raising hell until I can figure out the right answer for the client. If I don’t believe in what I’m talking about and what I’m telling people, I can’t do it. If the numbers don’t add up, if there’s an issue, they’ll catch it. I have to catch it first. In digital, I feel like there are fewer fires because we work directly with the source—Google, Bing, Facebook, etc. We can see really granular data, and we can sit down and dig through Google Analytics, learn things, and help explain—in human speak—what’s going on. It’s a lot easier to identify gaps, errors, or tracking issues. We have alerts set up to help us be proactive. D: So, if the challenge in traditional marketing was not having enough numbers, or numbers you could trust, is it now those numbers aren’t what the client wants to see? C: It’s intimidating at times. As the proxy client, it’s my job to identify that and question our team. And it’s never easy to question your peers. I see the team working hard and doing a heck of a job, so it’s hard when I have to come back and question someone about why this or that is down. But if I see the smallest percentage off, I have to ask. I have to ask what the client is going to ask. I try to view myself as the protector of my team and the protector of my clients. I try to put myself right in the middle. D: What’s the first thing you teach new account managers? C: The first thing I teach new account managers is how to work with our team. If you don’t work well with our core people, how are you going to do a good job for the client? Working with our team is the backbone of our client relationships. The first thing I teach new account managers is how to work with our team. If you don’t work well with our core people, how are you going to do a good job for the client? We have our own ways of speaking to each other, and we’ve developed this as a group over the last two or three years. 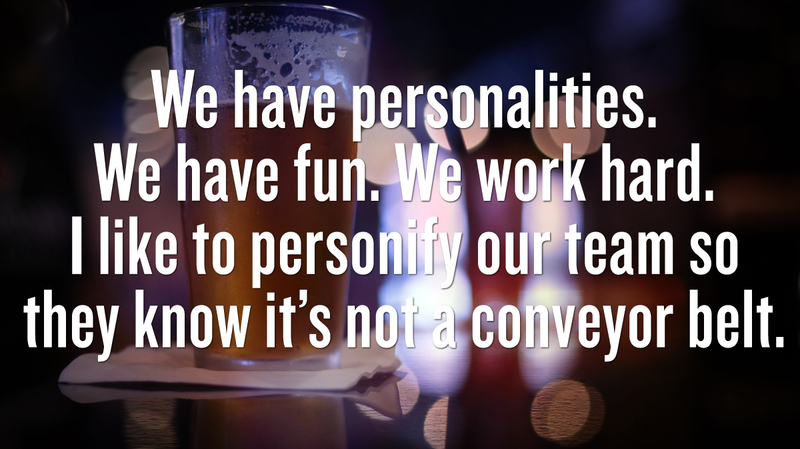 There are certain ways to communicate—and not communicate—with the team. You need to treat the team as experts. I’m not the expert. You guys pull together the strategy with my help and approval. You can’t go and say “What did you do here?” or “What the hell happened?” If year-over-year or month-over-month growth is down, is there a tracking issue? Can we sit down and look at it together? That way we can go back and tell the whole story to the client. The second thing I teach them is how we communicate to our clients. That includes client transitions from one analyst to another, from one account manager to another. We have a transition process in place with two months to introduce people and make sure everybody’s comfortable with the new relationships. Brian and Andrew have been really good about teaching me ways to communicate in different circumstances. When things are going great, we celebrate, and we celebrate with the client. When things are not going great, we identify the issue and come up with a solution. We’ll say we were wrong about a scenario or found this issue and have done XYZ to prevent this from happening in the future. This is part of the work. Things will happen, but it’s how you communicate them. I feel at ease because I don’t have to worry about the conversations I’m having. We’re willing to be wrong and willing to learn from that. We’re willing to be wrong and willing to learn from that. That’s huge. That allows me to go to a client and say we tried something and it didn’t work, but here’s the next phase of that test. I’m really proud of who we are. If I wasn’t, I wouldn’t be here. D: Is that expectation of honesty something you keep implicit or do you make it explicit? C: I like to call it out. I like to let clients know what they’re going to get out of us. If they’re new and I’m introducing myself, my job is to make their lives easier, to streamline communication with the team. The more they understand about how our team works and tests, the better they’ll understand how we run phone calls, show results, present metrics. It’s important not to wait for them to pick up on it. Some people are excited to be a part of that process, others are too busy. We may be number 11 on their list of vendors. As much as it hurts my soul [laughs] to hear that I’m 11—because they’re my number one—I understand and appreciate that they’re focusing on different things, and they’ve hired us to do what we do because they don’t have the time or resources. We have humans. We have personalities. We have fun. We work hard. I like to personify our team so they know it’s not a conveyor belt. It’s a human approach customized to each client and strategy. I like to know their business goals and what they’re trying to achieve that year so that we can get on the same page. Then, it’s about educating and benchmarks and starting points—where they were before, how we can get them to a reasonable level of success within a certain period of time. We can shoot for the stars and always will, but if we come short of that, it’s not failure. It’s progress. You build off what you learn, and as we continue to grow and test, we’ll continue to hit goals and make attainable goals. You’ve got to build a starting point and see what data and user behavior show you. People understand baselines. They understand benchmarks. It’s a little bit of education about what we’re providing so that they can follow our thought process for goal setting. We believe we’re putting together long-term strategies that will move the account forward. If we’re working on a month-to-month strategy, we’re not doing our jobs. We’re at the sophistication level where we’re building quarterly and annual strategies for clients. The work we do can influence everything clients are doing offline. Our agility and ability to pull data straight from search engines, to analyze the different paths of users, gives us a bigger view of how people interact with their business. D: How do you combat the shiny objects that other vendors dangle out there from time to time? C: A lot of the shiny objects that clients get are not worth the money that goes into them. I don’t know if they can get the return data, if it’s as effective, and there are usually other ways to achieve it within our scope. But I want people to make their own decisions. I’ll tell them to run a test and see if they get the return they’re looking for. We want to work with like-minded businesses that value the same things we value. That’s one of our goals. If they’re not understanding the work we’ve done to move their businesses forward, partially I think I’ve done something wrong because I’m not educating and laying out the right expectations. D: Regardless, there are a set number of levers we can pull as digital marketers. What do you think we’re doing to differentiate ourselves beyond results? C: I like to highlight that we have a dedicated team as a resource on any account. It’s not just one analyst. We collaborate, we brainstorm, we’re always sharing wins and challenges and getting better as a team because of that. On the PPC side, we’re always running A/B tests. We’re testing our methods and improving them. We’re transparent about the work we do, the tools we use, and the strategies. We’ve aligned our strategies with other campaigns clients are running. We’ve aligned with The Martin Agency to support major marketing efforts for Land O’Lakes, Purina Mills, and Kozy Shack in the digital world, and it’s been a strong partnership. D: Is face-to-face still the best way to communicate? C: I always think face-to-face is the best way to do it. We’ve had great success with video calls with clients. The team at eaHELP opened our eyes to video. All our meetings take place through video. I feel like I know them, I can connect with them, I can see their personalities. It gives that extra layer of humanity. Phone calls are hard. You never know when they’re muting you or what their facial expressions are. When I’m talking to people on the phone, I’ll actually Google them and look up their picture. That may sound weird, but it makes the connection. D: Anything you wish analysts understood better? C: I sometimes wish analysts could make their work more client friendly from the get-go. Client-friendly means ready for clients to review, understand, and pass along to their boss, if they have to. It’s simplification of data and how we talk about it. We are very analytical people. We draw a lot of comparisons. We’re proud that those comparisons show growth, but it’s not what everyone wants to see. It’s not an easy glance to see the needle moving. You have to sit there and stare at the numbers and make your mind figure out what they’re telling you. We are very analytical people. We draw a lot of comparisons. We’re proud that those comparisons show growth, but it’s not what everyone wants to see. It’s not an easy glance to see the needle moving. I’ll go back to the team and say, “Rephrase this into three sentences,” or “Take the comparisons out and tell the bigger story.” If the client is in an elevator with their boss, and their boss asks how the partnership is going, what would you say? I always tell new account managers to imagine your client contact is asleep in the middle of the night, and their boss comes in and shakes them and says, “You have five seconds to tell me why we work with Workshop Digital or they’re fired!” If our contact has to stumble, then I’m not doing my job. C: Clients don’t always mean literally how they come across in their emails or requests. A lot of clients will send a question, and they’re really just asking for a simple thing. I think the team thinks into things a lot further than the client or I might. I’m always trying to find out, “What’s the goal of this question? What are they trying to get out of this?” I don’t always have the answer to that, but I can think about it, or see if there’s a goal to take and expand on. Sometimes there isn’t. It’s really important to ask follow-up questions to understand better what we can provide them. There’s a happy medium with translating client requests and asking the right questions to help the team do their job well. There’s a happy medium with translating client requests and asking the right questions to help the team do their job well. I’ve started to make a list of the questions I need to ask when things come through. It’s still better to meet in person and talk through it, most of the time. D: For you, how has the transition to digital affected happiness in your work? C: I think digital is much more measurable. It’s easier to make decisions based on data than print. It’s changing so much that it’s always exciting. The team is sharing information every day, so there’s never a dull moment. It’s an interesting industry that I don’t see going away anytime soon. It’s only building off what it already is. Being part of a company that has been there from the start and evolved with it, we’ll be even stronger because of that. You guys are the smartest people ever, and I get to sit there and listen to you all talk about this stuff. D: But you’re doing the hard stuff. The mystical knowledge is managing the client relationship. That’s very difficult to communicate. We’re working through tools and data while you’re trying to perceive the tone of an email. C: That just doesn’t feel hard to me. D: And that’s why you’re so good at it.